Rangipo Museum is located on Rangipo Station which is a 450 acre (200 ha) farm situated one mile south of Kaiaua on the Firth of Thames. The property hosts stunning views of the Firth and Coromandel ranges from the Rangipo Pa site. 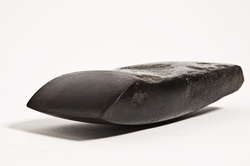 The Museum has over 600 years of maori and european hand tools. The Pa is massive covering 36 acres (14.5 ha) and there is a road to the Pa site. There are also rare mimulus repens plants, chenier plain shell banks and long fin eels available for viewing. Guided tours are offered that take a leisurely hour and a half to complete. Bookings are essential and children are free. When booking please let us know your interests. Cost is $10.00 per person. The address is 729 East Coast Road, Kaiaua. Rangipo Museum and Pa Site is an easy one hour drive from Auckland on the Pacific Coast Highway. 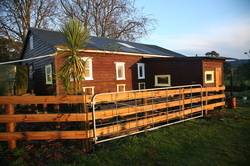 Rangipo Museum is housed in the old woolshed which was re-built in 1936 from the old Kaiaua Post Office. The museum has over 600 years of Maori and european hand tools presenting a timeline of progress from stone to metal over the centuries. Rangipo Museum has seating for visitors to bring their own lunch while enjoying the displays and view. The mighty Rangipo Pa site has had archaeological digs carried out and these determined the main pa was primarily built for prestige, with smaller pa sites within the overall outline being heavily defended (pre-European). There is a road to the Pa site which can accommodate buses and cars meaning only a 2-minute walk is required. The views from the Pa site are stunning and include most of a spiritual waka with Mt Te Aroha and Mt Moehau being the prow and stern. The Firth of Thames creates magic and there are 360 degree views back to the Hunuas. Native monkey flower or Mimulus repens that is endangered. Longfin Eels in large numbers in Te Pueaharuri Stream (nationally threatened). Best examples, possibly in the world, of least-modified Chenier Plain shell banks.